How to learn Scuba Diving in Cozumel for Beginners? If you are adventurous and you are preparing for your next Cozumel holiday, then you should think about taking the best scuba diving trip in cozumel. Without any doubt, scuba diving is an excellent recreational activity, suitable for almost every category of people. Of course, you will have to be a good swimmer, and you will have to learn some basic things about this water activity if you want to get the most from your diving session. The good news is that Cozumel has many beautiful scuba diving spots that are perfect for beginners. So, even if you are a complete beginner, you don’t have to worry about that because there is no better way to learn how to conduct this activity than taking a course here. Why is Cozumel Island a great option for beginner scuba divers? Experts in this field agree that Cozumel have one of the preferred dive sites in mexico. Situated in the Caribbean Sea, this island is a real scuba diving jewel; this is also the place where you will find the world’s second largest barrier reef. Cozumel is the place where divers can find coral gardens. The Paradise Reef South and North is one of the places where scuba diving beginners go. Generally speaking, the reefs are shallow and don’t go over 50 feet (around 30 feet on average). One of the best things about scuba diving in Cozumel is the fact that the waters surrounding this island are transparent which makes diving enjoyable. If you are practicing this activity in Cozumel, you can expect to see many beautiful sea fans, brain corals, gorgonians, sponges, crabs, star corals, moray eels and tons of tropical fish. The warm waters all year round promise many exciting moments. What is the best Cozumel scuba diving company for beginners? 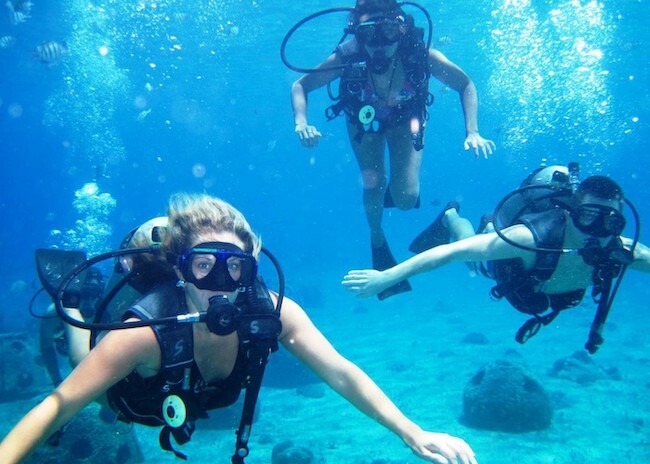 If you want to learn how to scuba dive in cozumel, you should look for an excellent scuba diving company. My Trip is the best and official PADI Discover Scuba Diving Program in Cozumel for beginners. With this program, you will be able to find out more about the first safety guidelines and skills that divers need to dive correctly and the entire process is monitored and directed by a PADI professional. The courses take place in shallow waters, but these waters are rich in wildlife too. You will also learn how to use scuba diving in the right way and develop skills needed for scuba diving. With My Trip, you will enjoy swimming around and exploring the underwater world around Cozumel.